As environmental branding continues to trend, businesses are experiencing benefits beyond adding a splash of color to the office. From wall décor and office graphics to decorative privacy film for conference room windows, interior graphics don’t just fill space. Projects challenge marketers to understand the implications for a company brand. They present graphic designers a unique canvas to share a company story. In many cases, installations foster team-building as ideas are crowdsourced from different departments. 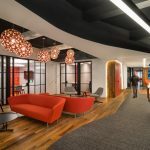 From enriching the office space to encouraging collaboration, we caught up with three growing companies to discuss their recent installations. The goal? Find out more about the motivation and project results. Wyzant is the nation’s largest community for one-on-one learning. With more than 80,000 experts qualified in 300+ subjects, they offer the best way to get the personalized help you need, when you need it most. Recently, Wyzant completed a branded graphics installation at their Bucktown corporate office. Mandy Pekin is CMO and Andi Mints is the graphic designer with the Wyzant team. They recently shared their thoughts on why graphics make an impact on the office environment. Wyzant uses interior graphics for staff member photos. Employees select the area to use as a backdrop. Image courtesy of Cushing. Was the office graphics project part of an overall marketing strategy or another plan? Andi: It was part of a major rebrand we did last year (August 2016). Since we’re a digital company, we needed something tactile to represent what we do—Wyzant is about helping people learn. It had to connect the dots between our brand internally, our employees, and who we’re serving outside the office. So it had to be consistent. Mandy: We wanted to bring the brand to life within our office. It was a chance for our team members to see the brand when we step into the office every day. Has it become something staff and potential customers discuss? Andi: Yes, we put branding outside as well – external signs – and there was a buzz around that! It created a sense of pride around the workspace. Mandy: There’s an element of surprise when visitors see how broad our subjects are – the stairs reinforce the breadth of skills and subjects. It’s a great tool to show our visitors how vast an array of subjects’ the tutors teach every day. Andi: We do use some of the graphics for backdrops of employee photos – we let folks pick the spot they would like to take their photo. It works well and employees have fun with it! The Wyzant brand is further emphasized by using the logo throughout the space and in imagery used in their photos and communications. Image courtesy of Cushing. Long-term, do you feel the graphics help tell Wyzant’s story? Mandy: They reinforce our brand, and our commitment to learning. The new branding and visuals around the office help us tell the Wyzant story within our walls, and are an excellent springboard for future work. The McShane Companies is an integrated commercial real estate development and design/build construction company that provides its clients with tailored real estate and construction solutions. The firm, established in 1984, offers general consulting, strategic planning, site selection and analysis, build-to-suit and speculative development, financing, design/build construction, general construction and construction management services. Josh Crankshaw is the marketing manager at The McShane Companies. From recognizing the team to an office open house, he shared some details behind their recent office graphics installation. Marketing Manager, Josh Crankshaw and Graphic Designer, Jim Gray of the McShane Companies smile for the camera. Environmental branding behind them is a mix of acrylic, dimensional lettering, and wall graphics. Image courtesy of Cushing. Was the office project part of an overall marketing strategy/plan? Josh: We rebranded last June, and it seemed like a good opportunity to reinforce the look of our brand. The more we talked about a potential installation, ideas kept coming, and it became a call to reinforce our brand statement and express who we are. Brainstorms had us thinking of ways to incorporate people into the installation & environment, so that was very important and part of the overall strategy. We recognize new employees by installing their headshots on the columns. It makes everyone feel like they are a part of the team. Jim is a great designer (Jim Gray is a graphic designer at McShane). As a construction company, bricks are a motif that makes a lot of sense for the office graphics. Are the bricks something staff and potential customers discuss? From Irvine, California to Auburn, Alabama, everybody who works for McShane has their headshot posted on the column – so everyone knows they will be recognized. We can easily switch out and update the photos whenever we need to. The modularity of the bricks and ability to make changes is an added benefit. Team members know we’ll be in touch for their photo, which creates excitement, and is a source of pride. In our business, people are your most important asset – this created a very collaborative feel for the office, and provided an opportunity to showcase our greatest asset: the people who work here every day. New team members at McShane are recognized on office column wraps. “In our business, people are your most important asset.” Josh Crankshaw, Marketing Manager. Image courtesy of Cushing. When guests visit, are the graphics part of tours? Yes, the graphics are part of a tour, each one! That happened organically, and is one of the indirect benefits. During our open house, it became another focal point with guests and we have received great feedback. We onboard new team members, which means we do a lot of events. At McShane, it’s a serious but relaxed working atmosphere, and the graphics reinforce the idea of team building. We market our people and project experience – it’s in every proposal I put together – the installation is another part of our employer brand and story. Long-term, do you feel the graphics help tell McShane’s story? It helps people understand everything we do here and teaches younger people about the development side of the business. For instance, it provides a big picture overview of everything we do and all the important facets that go into that process (you can read about each when viewing the wall graphics). On the construction side, as we onboard new employees, they get a better feel for what we do as a whole. The graphics capture attention (which is harder than ever with smartphones & busy schedules). Last but certainly not least, Interfaith Youth Core is making interfaith cooperation the norm in America. In colleges and universities, conversations take place that can shape the minds and values of our emerging leaders. These conversations can steer broad cultural changes. The students engage with leaders across the campus environment, from faculty, staff, administrators and students who can offer tools, guidance, opportunities and networks they may need to bring interfaith learning to their campuses, classrooms, research and lives. Amber Hacker is the Vice President of Operations and Communications at Interfaith Youth Core. She welcomed the opportunity to discuss their recent environmental branding project and just found out they are in the running to be one of Crain’s Chicago’s Coolest Offices. Keep your fingers crossed for their team as they continue down the path! Members of the Interfaith Your Core staff are all smiles in front on their office branding. Team members participated in planning and brainstorming from the outset of the project. Image courtesy of Cushing. Was the office graphics project part of an overall marketing strategy/plan? Amber: How do you get across your mission and story when it is so unique? We just moved into our new office last year, and as we thought about living in this new space, we decided we had to invest. We’re in our space for the next seven years, which is a long time! It was not part of the plan, and frankly not part of the budget – but once we moved, we realized how critically important it was to invest in the graphic resources to highlight our brand, story, and history. For instance, we saw neighboring companies use their office space to communicate their work and vision. It became an ‘aha’ moment: we must figure out how to showcase our goals, our history and most importantly: who we are. We realized it was important to incorporate into our work space. Have you received feedback from coworkers and guests on the new graphics? Yes! I would say we have received positive feedback from folks who see them every day and people who only visit only once or twice. Our staff has embraced them so much because we sought their involvement from the very beginning. Was that an intended outcome or goal of the installation? We conducted a visual listening exercise conducted by the design team from Perkins+Will. It included associates who had just started and veterans with Interfaith Youth Core, over ten years. We wanted different links of tenure and kept asking: what’s most important for you in this space? Staff can spend more time here than they do in their own home! That’s a big deal. We wanted to provide a space that would allow them to do their best work. Central funders. Staff and family. Students, faculty, staff and administrators. With staff involved early, it helped Perkins + Will put together the design. An interesting result is that neighboring organizations who have visited our space, see the graphics and think about how they could visually tell their story. We are so happy to share our experience. Custom graphics highlighting the organization’s branding, mission and history are installed throughout the office space. Image courtesy of Cushing. Have you used the graphics as part of a marketing campaign (for example, an email newsletter, website photos, or direct mail piece etc.)? We have shared them on social media channels. Our work space is one way we can share who we are as an organization, the graphics are a huge part of how we tell that story. Long-term, do you feel the graphics help tell the Interfaith Youth Core Story? At the core, branding is about how external audiences experience the organization. Not just about a website or piece of collateral – we had to think about the ways people are experiencing our brand – and visiting the office is one of those ways. It’s an extension of who we are as an organization. Our space can serve as another powerful way to tell our story. As applications in environmental branding evolve, graphic experts are challenged with coordinating unique installations that extend the brand experience. From company history to recognizing team members, graphics comes with a purpose and plan. Who knows what will come next?